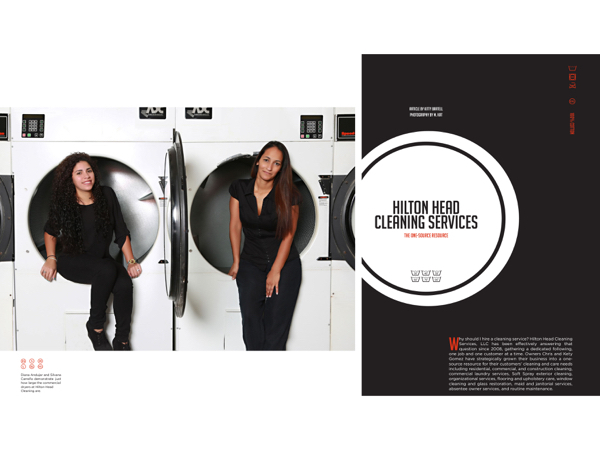 Diana Andujar and Silvana Carreño demonstrate just how large the commercial dryers at Hilton Head Cleaning are. Why should I hire a cleaning service? Hilton Head Cleaning Services, LLC has been effectively answering that question since 2008, gathering a dedicated following, one job and one customer at a time. Owners Chris and Kety Gomez have strategically grown their business into a one-source resource for their customers’ cleaning and care needs including residential, commercial, and construction cleaning, commercial laundry services, Soft Spray exterior cleaning, organizational services, flooring and upholstery care, window cleaning and glass restoration, maid and janitorial services, absentee owner services, and routine maintenance. Understanding that the next job is always contingent on the quality of the current one and that referrals are the core of their success, HH Cleaning Services has built on the success of their residential cleaning business by growing their commercial cleaning offerings. Expanding and upgrading their on-site commercial laundry this past winter, they can now provide exceptional, affordable laundry services to even more companies needing to outsource their laundry needs. “We have brand new top-of-the-line machines, and we have the ability to take on more of this business,” Kety said. Arlon Mata, Alex Guardado and Christian Castro of Hilton Head Soft Spray clean a Bluffton house with a low-pressure method. Hilton Head Soft Spray is a sister company to Hilton Head Cleaning Services. HH Cleaning Services’ sister company, Hilton Head Soft Spray, offers residential and commercial clients with brilliant exterior cleaning services. “Our exterior cleaning does not involve a pressure washer,” Chris said. Using a low-pressure cleaning method that is, in most cases, more effective than high-pressure washing and is less damaging to the structure has garnered rave reviews from their customers. Another way HH Cleaning Services provides the finishing touches to their work is the package options offered to their rental property owner clients. As properties are cleaned and prepared for turnover to the next rental guests, three tiers of amenities are offered. “What makes us a little different is that we provide three different quality brands of bath amenities and three qualities of linens and towels,” Chris said. The rental owner selects the level of products, linens, and towels that best fits their needs. The peace-of-mind and time savings provided by a clean, organized home or business is just the beginning of how HH Cleaning Services takes care of their customers. Every customer is guaranteed a professional job that will meet their expectations, where their property is well cared for and protected, and where each member of the team has gone through an extensive background check and detailed training. “A lot of companies are competing for good cleaners,” Chris said. Providing their team with work vehicles, along with good wages, and additional incentives helps them to retain great employees. This level of consistency, along with pricing each cleaning job by the hours worked rather than by the project, gives HH Cleaning Services’ customers a great deal of control over how their property is cared for and the work that is completed. As the business has grown, so has the Gomez family’s involvement in the local community and their charitable endeavors. With three active children focused on school, soccer and ballet, their attention is often centered on school-related activities. Additionally, HH Cleaning Services welcomes opportunities to support cancer-related causes like Cleaning for a Reason®, an organization that enlists cleaning companies to offer home cleaning services to cancer sufferers. They have also been longstanding platinum level supporters of the Children’s Miracle Network through the efforts of Hilton Head Island’s Namaste Spa. It seems the question has been effectively answered. Hilton Head Cleaning Services is the one-source resource, furnishing all the right reasons to hire a cleaning service. For more information, please visit hhcleaningservices.com or call (843) 689-9907.